Steve Diggon (on screen) discusses lessons learned during the MaPP process at the 2nd International Conference on Marine Maritime Spatial Planning. Photo credit: Steve Diggon. 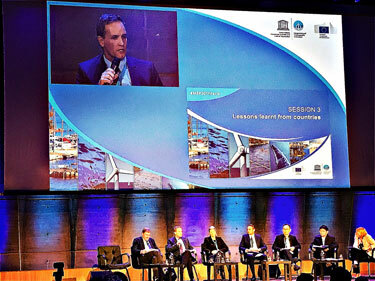 Steve Diggon, regional marine planning coordinator for Coastal First Nations-Great Bear Initiative, was a panel speaker at the 2nd International Conference on Marine Maritime Spatial Planning in Paris, France from March 15-17, 2017. Steve joined other experts from Europe, Africa, Asia and Latin America to share their practical experience of marine spatial planning. The conference was also a valuable learning opportunity for Steve. “It was especially interesting to hear about the complexity of marine spatial planning processes in the Baltic States with the number of international borders and security issues. The MaPP process did not have to deal with those considerations,” he said. The main objective of the conference, which was hosted by UNESCO and the European Commission, was to review the status of marine spatial planning – one decade after the first International MSP Conference – and to identify a path forward that addressed multiple global challenges from 2017 onwards. 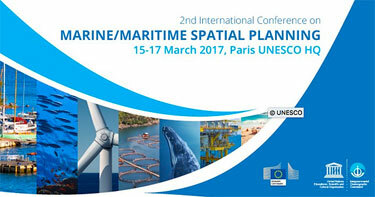 The outcome of the Conference is the Joint Roadmap to accelerate Maritime/Marine Spatial Planning processes worldwide. The roadmap was presented to the UN Conference on Sustainable Development Goals 14 held in New York from June 5-9, 2017.